In terms of the issues that are of immediate relevance to Greece and its government, Obama delivered a strong message on debt relief and austerity. It was a polite and balanced takedown of the way the eurozone has dealt with the crisis, and continues to approach the problem in Greece. Firstly, he addressed the impact the crisis has had on Greek society – an issue that is often overlooked in the analysis provided by European politicians. Then, there was the emphasis on the structural reforms needed to ensure that Greece addresses the weaknesses that contributed to the current mess. After that he provided a simple but piercing critique of the eurozone’s economic approach when faced by its first major crisis. 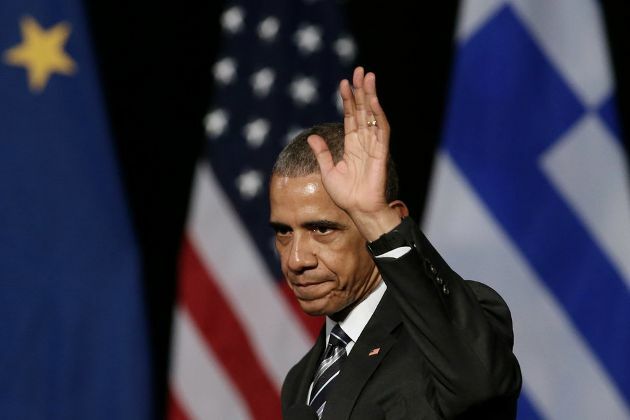 To create this space for a Greek recovery, debt relief will be vital, according to Obama. He even gave a nod to the political difficulties of discussing this issue in some of Greece’s eurozone partners. “Now, the politics of this are difficult in Europe,” he said. “And I think in fairness to some of the governments up north that I know are not always popular here in Greece, it's important to recognise that they have their own politics. And their populations and their institutions often are resistant to some of these debt-relief formulas. His call for debt relief and a let-up in the fiscal pressure exercised by austerity was by no means revolutionary, nor indeed original. In fact, Obama’s message was almost identical to the comment he made when he met then Prime Minister Antonis Samaras at the White House in August 2013. The difference between the two statements is the context in which Obama placed them and how global political and security developments have changed the background against which Washington’s call for debt relief is being made. Three years ago, Syria was not being ripped apart, Greece was not at the frontline of Europe’s efforts to deal with a massive refugee influx, Turkey looked relatively stable and the far-right had not made alarming advances in European countries and the US. In this changing environment, Greece – positioned on the edge of the EU and next to a region of the world that is becoming more unstable by the day – takes on a vital geopolitical significance. Apart from being an EU member state, it is also part of NATO (and one of the few alliance members that meets its defence spending targets), regularly hosting joint-military exercises, and provides use of naval facilities to its allies, including the US, at Souda Bay in Crete. The US has been trying to encourage the eurozone to adopt a different crisis strategy since the start in 2010, with very limited success. So, why should be any different now? Especially, given that Obama is a lame duck and will be followed by a president that does not guarantee policy continuation at the White House? Well, this is exactly why Obama stressed the political and geopolitical dimensions. These are elements that will long outlast his presidency, are of long-term interest to Europe and have become an even pressing concern because of recent developments. That Obama followed this comment by noting that Greece is “one of the five NATO allies that spends 2 percent of GDP of defence” and comments relating to intelligence, terrorism and the refugee crisis was no coincidence. “Greece cannot be expected to bear the bulk of the burden alone,” he added in his speech on Wednesday. Should the geopolitical context not be enough to move the needle, Obama added the purely political dimension, which might be closer to some decision makers’ hearts as it has potential domestic consequences. The Democrat politician drew a direct link between the economic policies being pursued and the growing disenchantment of voters who are turning to more extreme parties and leaders out of frustration. “Globalisation, combined with technology, combined with social media and constant information, have disrupted people’s lives, sometimes in very concrete ways… but also psychologically,” he said in response to a reporter’s question on Tuesday. This was an idea that Obama revisited with some vigour on Wednesday, stressing in his speech the threats to democracy and the importance of safeguarding liberal values. Perhaps this time, because Obama is speaking as the leader of a country that has seen this phenomenon take root and lead to the election of a populist leader, his message to his European counterparts who want to avoid been swallowed up by the extremist tide might carry more weight. Maybe on this occasion the EU will take off its blinkers and see the bigger picture, weighing up geopolitical concerns against the very narrow anxiety of moral hazard when it comes to shaping its economic decisions. It could be that in the spreading climate of fear and antagonism some European decision makers will muster the courage to speak to their voters with honesty and explain the context in which tough decisions have to be taken. If Obama’s visit to Greece could achieve this, it would be some legacy for the US president. Reality, though, means that it is unlikely and that in years to come we might look on his visit to Athens as a moment, much like his presidency, that opened up possibilities and generated hope only to be submerged in an ever-more fractious world.